Not wanting to waste the last warm Sunday afternoon we may see for a while, I went for brunch to catch up with friends. Some of us wanted breakfast and others wanted lunch so we knew a pub was in order and I suggested Kramer's. 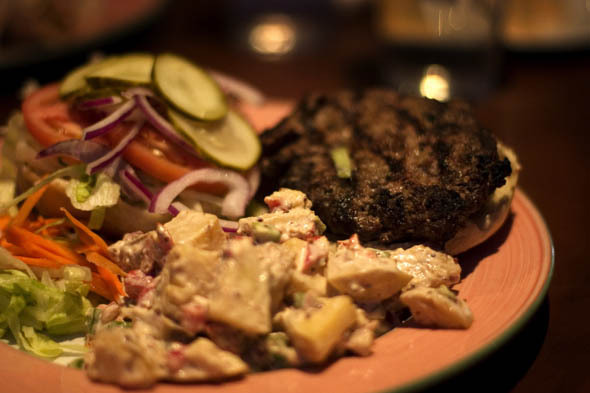 Kramer's sits near the intersection of Yonge and Davisville, across the street from the ever popular Bow and Arrow . When we arrived and one of my girlfriends said she was starving, I worried we could be headed for trouble. I've eaten at Kramer's many times and the service can be surly, slow or both. Not as slow as Mad Monty's but certainly slow enough to send someone into a cantankerous hypoglycemic mood. I knew we were off to a good start when a shiny, unfamiliar face instantly greeted us with menus and promptly brought us drinks. She obviously hadn't yet been schooled in Kramer's brunch philosophy of waiting 30 minutes to bring water. We were quickly lost in laughter from the past week's antics and office gossip and only looked at our watches once to see how much time had passed. Kramer's, as always, was busy for brunch so we didn't think the wait was unreasonable. The sweet potato frittata ($11) was a great healthy alternative to the tradition sausage and eggs breakfast. An overwhelming portion of sweet potatoes encased in eggs arrived, packed with spinach, sun-dried tomatoes and creamy goat cheese with hearty toast on the side. As a lunch option, the Kramer's burger ($9) would have even been a challenge for Takeru Kobayashi's stomach. Made from scratch, the mammoth hamburger was accompanied by a mountainous mass of red potatoes shellacked with Dijon and mayonnaise. As good as it was, only a quarter of it was devoured. 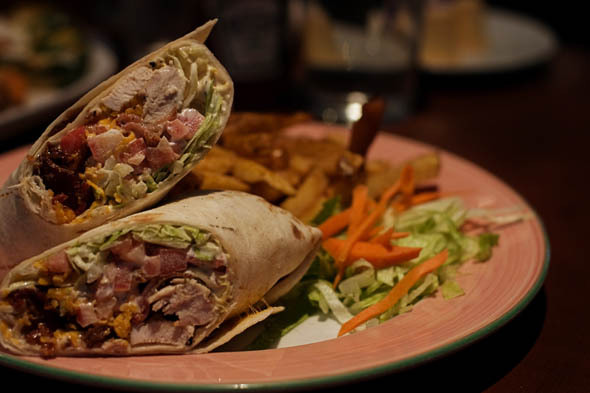 The CBC wrap ($9) was as to be expected - a standard wrap with bacony goodness filling out the flavours. Oddly enough, both the hamburger and wrap was strangely garnished with some shredded iceberg lettuce and carrot. I'm not sure if the kitchen felt that there was not enough food on the plate, but a generous portion of home fries negated any need for a sad coleslaw replacement.